As Forcelandia cruises into our 4th year, we are excited to share that we have added a new person to our intrepid team: Simon Goodyear, Salesforce MVP and Salesforce Technical Architect at Oodle Finance, from Wiltshire, England. Some of you may recognize his name from another excellent community conference – London’s Calling! Like our awesome Evan Johnson, who originally hails from Snowforce, we now have that much more experience in bringing you the best event ever! 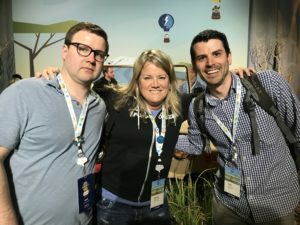 Simon, Angela and Evan at TDX 2018, while Larry kept the home Forcelandia fires going. While we are dry-cleaning our capes to live up to Simon’s view of us, in the meantime, he has capably stepped up to be the lead for our fantastic Forcelandia speakers. With his deep programmatic and instructional experience, we think he is a natural fit as we work to deliver a valuable developer conference full of technical content. And pie he shall have! If you are a Forcelandia Speaker, be ready to do whatever Simon Says (and I can just feel his eye roll at that from across the pond…). Welcome to the team, Simon – so glad to have you! And if you are still interested in submitting, we have a few spots left so submit now!